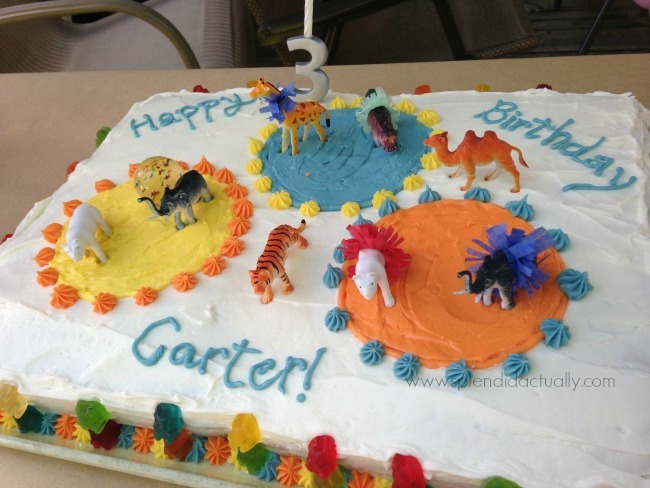 Earlier this month my nephew Carter turned three. Since throwing parties is basically my favorite thing, I offered to help my sister with the bash. 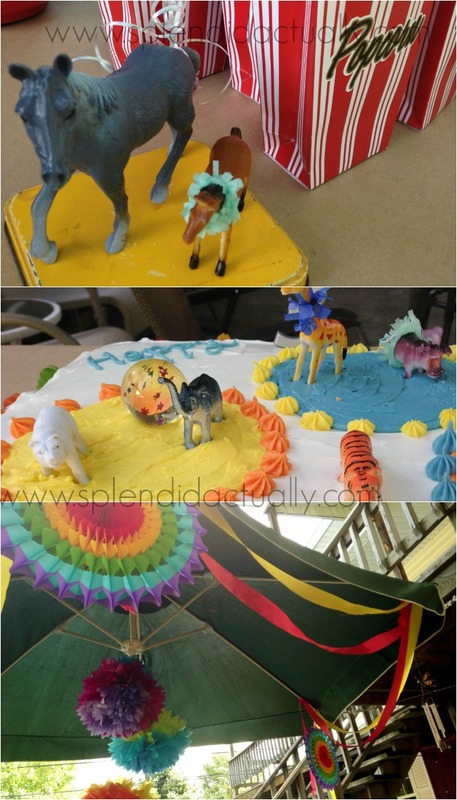 We decided on a circus theme because it would be bright and colorful - perfect for summer. 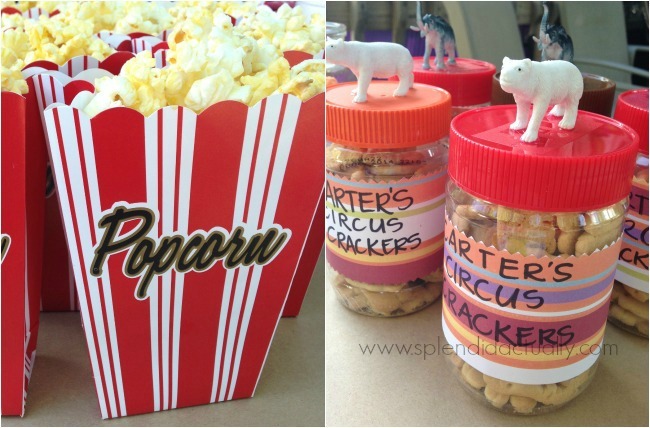 When I think of circus food, I think of popcorn, animal crackers, and circus peanuts. I found these boxes at Party City (which is where I found most of the decor), popped a couple bags right before the party and set them out for people to snack on while Carter opened his gifts. For favors, we filled peanut butter jars that we had saved with animal crackers. 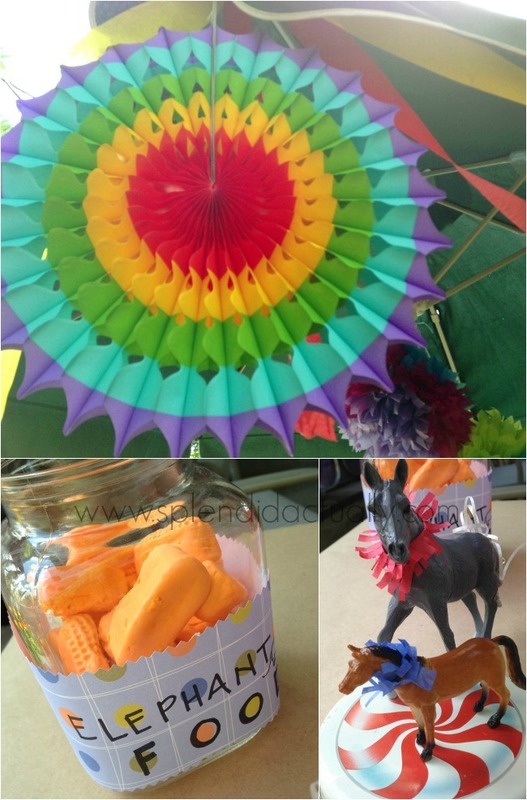 I used hot glue to attach the animals to the lid and a piece of scrapbook paper for the label. Like I mentioned, I picked up the fans and streamer from Party City. The label on the circus peanuts/elephant food is another piece of scrapbook paper. To make the animals look more "circus-y", I made tutu's out of tissue paper, securing them with tiny rubber bands and I tied ribbon around their tails. Last minute I tried to find small figurines to hot glue on the horses backs, but couldn't find any. Wish I could have thought of that sooner because it would have been awesome. Making the cake was fairly easy. We baked two 9x13 cakes, put them together on a cookie sheet and iced them as one. To determine the circle size, I used a bowl and gently placed the rim into the icing. It left just enough of a line to see so that I could follow it with my piping bag. After filling in the circle with the piping bag, I used a knife to blur the lines. The plastic animals received a nice, sudsy bath, and they were adorned with their tutus. Then I just placed them around the cake, along with the rubber star balls. With a star tip on my piping bag, I dotted around the circles and around the bottom of the cake. For the final decoration, we placed 2-layer gummi bears around the cake. It was a cute party, but not too over the top or expensive. And since the decor wasn't a specific character, we can always reuse it for the next party. 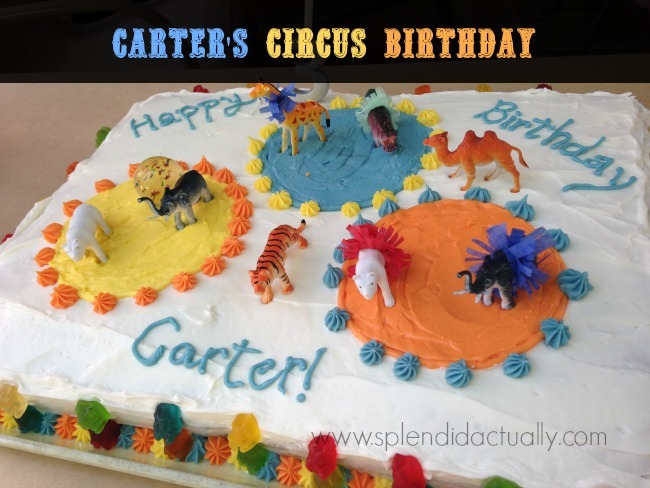 Plus, Carter loved playing with the animals after we demolished the cake!